Not to keep preaching the same message, but until OEMs hand out press releases or unveil devices on stage, nothing is ever confirmed. With that said, the newest development in the Galaxy S5 saga from Samsung are a new string of benchmarks to hit the web, further confirming previous reports that the device will not feature a QHD (2560×1440) display. Furthermore, from what these benchmarks point to, the Galaxy S5 will only feature a Snapdragon 800 and not the new Snapdragon 805 processor from Qualcomm. Another thing to point out are the reports of a 16MP rear-facing camera, as they appear to be in line with the benchmarks, and no other info out there has contradicted that. 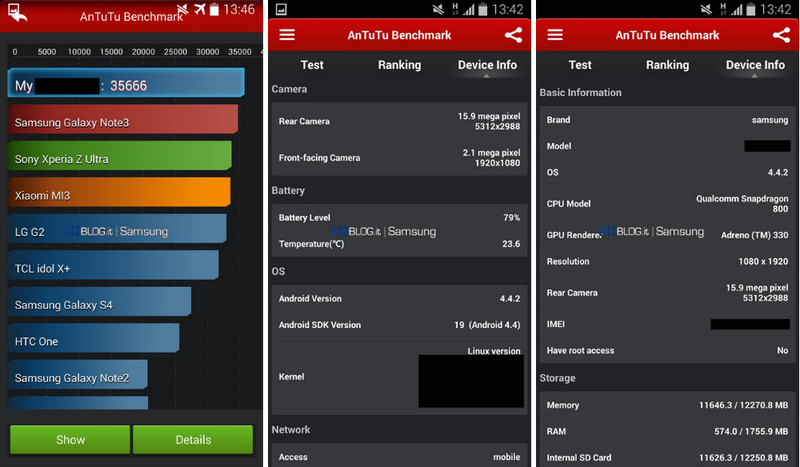 In the speed tests, the device used beats out the Galaxy Note 3 (Snapdragon 800 w/ 3GB of RAM), the LG G2 (Snapdragon 800 w/ 2GB of RAM), and the Sony Xperia Z Ultra (Snapdragon 800 w/ 2GB of RAM). So in terms of performance, we should see something quite impressive from Samsung, regardless of a crazy high resolution display. Personally, it would be great to see Samsung continue to push mobile technology with a QHD display, but is it really necessary? Wouldn’t we only see a large fall in battery life and graphic performance? We still don’t know what exactly Samsung has coming, but with the newest evidence pointing to a somewhat tamed-down device, try not to set your expectations too high as to where no phone could ever live up to them. Do you think QHD is necessary at this point for a top tier smartphone? How about 16MP sensors? Useful or over the top?